The oil spill that contaminated Chennai’s beaches in January this year had an unusual ecological takeaway. The spill was cleaned up using a technique called bioremediation. The technique works by making use of the natural ability of certain microorganisms to break down toxic compounds using enzymes. Enzymes are molecules present in these microorganisms that do the job of breaking down pollutants into non-toxic compounds, essentially getting rid of them by eating them. Possibly considered one of the most inert and harmless of environmental clean-up techniques due to its use of near-natural processes, various techniques of bioremediation have gained considerable attention both in academic circles as well as with the public in the past three decades. There are various methods of bioremediation. In Chennai, researchers from the Indian Oil Corporation Limited (IOCL) used the ex-situ (off site) method. Ex-situ cleanup involves transporting the contaminated material for safe treatment away from the site of contamination. Bioremediation can also be carried out in-situ, making use of microorganisms at the site. Another method is bioaugmentation, where non-indigenous microbial species are added to a contaminated site to enhance the breakdown process (see ‘Clean acts’). Bioremediation first got into popular scientific parlance following the Exxon-Valdez oil spill in Alaska in 1989, when millions of gallons of oil was spilled. When conventional methods failed to show any significant results, bioremediation trials, specifically the addition of fertilisers, were carried out. This resulted in enhanced activity of indigenous bacteria that biodegraded hydrocarbons, but the process slowed down once the readily available hydrocarbons were exhausted. 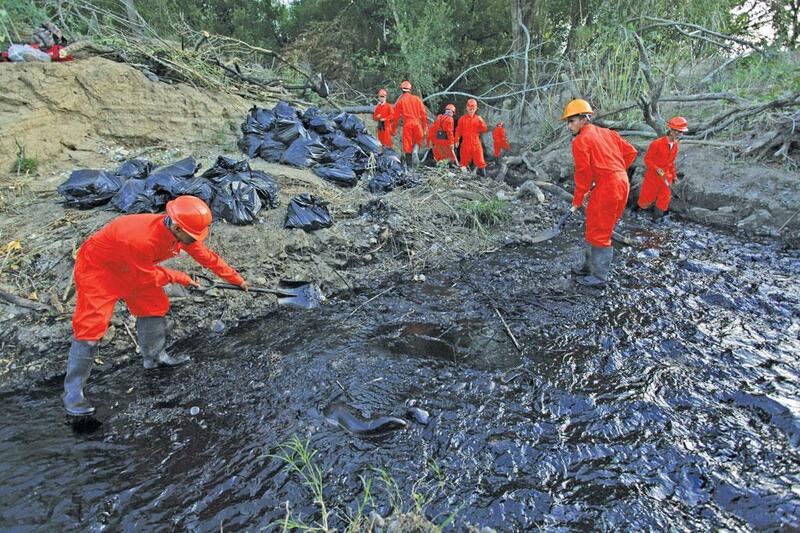 Following successful field trials, bioremediation was deployed on a large-scale to clean up the spill. While an actual quantification is difficult, beaches that were treated with fertilisers were observed to be cleaner than those that weren’t. Bioremediation is not just limited to cleaning oil spills. It has far-reaching applications in cleaning up contaminated soils, industrial wastewater, groundwater, mines, pesticide accumulated sites and fly ash disposal sites. The use of microorganisms in bioremediation is not limited to bacteria. Scientists have achieved considerable success in using fungi species such as Asper-gillus niger, A terreus, Cladosporium oxysporum and Mucor thermohyalospora to break down endosulphan, a highly toxic insecticide, into a non-toxic isomer. Indian researchers are also finding new pathways in bioremediation. A team from the Indian Institute of Technology (IIT), Madras, succeeded in degrading samples of crude oil by up to 80 per cent within 10 days using Bacillus subtilis, a bacteria derived from a polymer dump site. While a combination of different groups of bacteria is generally required to break down crude oil—since each group is limited in the kinds of hydrocarbons they can act on—it was observed that B subtilis could be used to treat a wide range of hydrocarbons in the oil. The team was led by N Sakthipriya from the Environmental and Water Resources Engi-neering Division, IIT-Madras. Laboratory trials have also demonstrated the successful use of electro- remediation in denitrification of soil, such as an experiment conducted on nitrate-rich soil in South Korea. The trials succeed in achieving 100 per cent efficiency in removing nitrates from soil samples, a significant finding especially for areas that practice input-intensive agriculture, where hyper- nitrification of soil and water due to overuse of fertilisers is a critical issue. There is another technique that combines electrokinetics and bioremediation. Here, in-situ treatment of soil pollutants known as Hydrophobic Organic Com-pounds (HOCs), which include hard-to- remove compounds such as petroleum byproducts, herbicides and byproducts in chemical manufacturing, can be cleaned up. It remains to be seen if governments across the world fund further research, and more importantly, whether industries, both large and small, will use bioremediation to clean up their sites. This story was first published in the June 16-30, 2017 issue of Down To Earth magazine under the headline "Age of bioclean".